Mortice locks are so called because they are fitted into a cutout in a door called a mortice (as in mortice and tennon). Locks such as the one shown here are generally fitted to timber doors, but can be found in steel and aluminium doors also. Traditionally, these locks are what we term as lever locks, meaning that they use a larger key unlike the Yale nightlatch shown above. 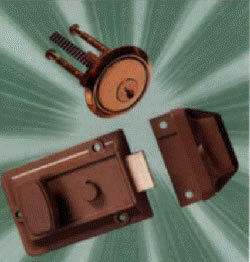 Mortice locks can come in two versions. The sashlock type (shown left) which uses a handle to pull back the latch bolt and a key to open the locking bolt. Deadlocks which do not use a door handle so usually, from the outside of the door, all you would see is a small keyhole or keyhole cover called an escutcheon.